The Spanish flag, flags of Spain. What colour is the Spanish flag? 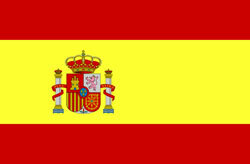 The flag of Spain in Spanish - Bandera de España, as it was defined in the Spanish Constitution of 1978, consists of three horizontal stripes: red, yellow and red. The yellow stripe is twice the size of each red stripe. Traditionally, the middle stripe was defined by the more archaic term of gualda, and hence the popular name rojigualda. The origin of the current flag of Spain is the Naval Ensign of 1785,Pabellón de la Marina de Guerra under Charles III of Spain. It was chosen by Charles III himself from 12 different flags designed by Antonio Valdés y Bazán (all projected flags were presented in a drawing which is in the Naval Museum of Madrid. Throughout the 18th, 19th, and 20th centuries, the color scheme of the flag remained the same, with the exception of the Second Republic period (1931-1939), being the only changes centered on the coat of arms. The shield in the centre of the Spanish flag includes the Royal seal, which is flanked by two crowned pillars (the Pillars of Hercules) bearing the inscription 'Plus Ultra'. According to Spanish legislation, the height of the coat of arms should measure two fifths of the flag's width (i.e. hoist), and should appear in the middle of the yellow stripe. The flag's usual proportions are a length measuring three halves its width, in which case the distance from the hoist of the shield's vertical axis should be half the flag's width. In other instances (should the flag be either shorter in length or square) the coat of arms should appear in the centre. The most frequent alternative to flying a flag half-mast to indicate mourning is to stitch a small piece of black material to the centre of the flag. This is done almost only with flags not intended for hoisting, such as long flags displayed horizontally on balconies etc. Flags not intended for hoisting but which would be inappropriately defaced by such an addition (namely military colours) tend to use a black cravatte attached to the finial.